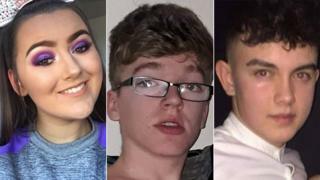 Police have identified more than 600 people who were outside a County Tyrone hotel where three teenagers died in a crush. Morgan Barnard, 17, Lauren Bullock, 17, and Connor Currie, 16, died at the Greenvale Hotel in Cookstown outside a St Patrick's Day disco on 17 March. Supt Raymond Murray said that 267 people have been interviewed to date. He said an interview room at Burnavon Arts Centre has been closed and people will now be spoken to at their schools. The PSNI said that it had identified 619 people as being in the car park or queue outside the hotel when the crush happened. It was previously reported that about 400 people were in this area. "As part of our investigation we have utilised the Major Incident Public Portal to allow people to upload mobile phone footage and images of the evening," said Supt Murray. "We have been downloading mobile phone footage from people at the scene by using one of our Cyber Support Vehicles in Cookstown. "It is still really important for anyone who has not yet contacted us to please come forward and work with police to help build an accurate picture of what happened that night." The funerals of the three teenagers were held in Cookstown on Friday. Two men, including the hotel owner Michael McElhatton, were arrested last week on suspicion of manslaughter.